Americans, you know the A45 AMG Hatch? ...you can't have that. 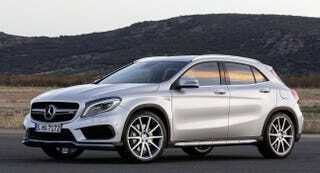 But you can have this instead- GLA45 AMG . Read more at CarScoops. Then again neither one will come with 3 pedals so I'm not too upset about this.